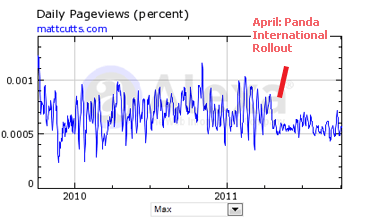 Was Matt Cutts’ Blog Hit by Panda? If you’re familiar with Google’s 2011 Panda update, you know that some 12% of all search results were affected by some pretty drastic changes in the way Google treats them. This includes not only individual posts, blogs and article pages – but entire sites, even sites that arguably are of high quality. Now, we’re asking ourselves if Matt Cutts’ blog is one of those sites. With so many webmasters devastated by the Panda update – and just as many complaining that high-value sites have taken the beating low-value sites were supposed to – Matt Cutts’ blog might be one of the most high-profile examples of Google Panda having unintended consequences. Mattcutts.com would certainly be expected to receive large amounts of international visitors due to its subject matter. Might that constitute an international site in the eyes of Panda? Not all sites impacted by the international Panda rollout were international sites. Third party traffic statistics sources like Alexa and Compete.com do not accurately measure site traffic, but the estimates they offer are commonly referred to in the search community. Google said the algorithm works even “deeper into the “long tail” of low-quality websites to return higher-quality results where the algorithm might not have been able to make an assessment before.” So if anything, it appears to impact even more sites and Google confirmed that, saying an additional “2% of U.S. queries” were impacted by this update. Impacted how? I do not think sites have claimed to be released from the algorithm update, even after updating their sites – but I do see more sites claiming they were hurt by this update. Google itself has listed some bullet points for measuring a site’s quality in the form of 23 questions site owners should ask themselves like “would you trust the information presented in this article?” however don’t seem to apply to all of the sites that are feeling a traffic crunch after the new algorithms were rolled out. If one of Google’s own – and undeniably a provider of value to the search community in Matt Cutts – is vulnerable, what other high-quality sites is Google missing? 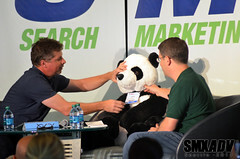 Was Matt Cutts’ blog impacted by Panda? If so, there may be more than 23 questions to ask. Update: Matt confirmed via Twitter that he was not impacted. Is the Google +1 Button Set to Fail? You would think that something as big as Panda would drive all the predictably panicky folks to Matt Cutts’ blog and increase the traffic. Yes, that would be one of my first reactions, go to the authoritative source. Good point above – you would think that more people than ever would be hitting up MC’s blog trying to get some clues as to how to deal with the Panda. Maybe paranoia has grown to the point where people think that their visits to MC’s blog can be logged and tracked back to their thin affiliate sites! Well, that would be ironic. Even though he supposedly isn’t affected, it’s clear that some powerful businesses and bloggers were. The search engines are always making tweaks to the algorithms and your best bet is to follow their guidelines and practice a white hat strategy to avoid a penalty. I had one chance to attend a lecture about Google Panda. From that time on, I’ve been very careful with my link building strategies and especially with my contents although I wasn’t really affected by the changes. As for the big quality sites, most of them were getting visits via thousands and thousands of long tail keywords , so they could be on top at any time. I guess the update is about making the game balanced. Since the Panda Update is determined by a Machine, then MATT CUTTS was spotted by that machine…You might find his blog has some Thin Content pages on the inside which triggered the Panda. Phillip, there are a number of original/rich-content sites that were hit by Panda and some not that much different from Matt’s. It’s not at all difficult to imagine that whatever tripped the others could impact him as well. Emory, so he got hit by his own system. Meaning the rest of the internet was doing what he promotes. ”Unique rich content”. There is nothing which hurts like creating rich data and get hit by these pandas. Time is money , and it takes a lot to write a good article. I use google daily, and i find lots of sites with thin content. I have a website i created in 2010, it was just a test with no adverts but all its content is thin and poor, but the site is never affected. Then i created a related site with better content and original, but it has Google Ads, and that one was affected. So i wonder what the trick is. ADS or Quality. Do they expect us to make quality with no ADS. Philip, yes, I think Google is using a heavy-handed approach that takes down too many sites driven by the average guy who’s probably doing most of the work on nights and weekends. What’s left standing is big brands, celebrities and those with hefty budgets. I do think it goes beyond ads or no ads, thin or thick content or the famous 23 questions. Google is not saying much about panda and recoveries seem rare. Keep testing and making changes until something works, I’d say.